India: Will it become the world's solar superpower? - Unearthed India: Will it become the world's solar superpower? India’s enormous solar power plan: Is it for real? Last week, in an almost offhand remark, India power minister RK Singh said the country would hold a colossal 100GW solar tender in the near future. Anyone familiar with Indian politics was likely skeptical — and for good reason. Grandiose promises with no detail or follow through are par for the course, particularly when elections loom, as they do next year. So is this just another great sounding target, like India’s 2030 EV announcement in 2017, with nothing concrete to back it up? Update: Yeah, the solar super tender probably isn’t happening. That’s what Singh reportedly told journalist Twesh Mishra shortly after the event at which he made the announcement. What first seemed like a casual commitment of the kind Indian politicians are prone to, was later echoed by the secretary of the ministry of new and renewable energy at an event in Germany, suggesting there could be something actually happening behind the scenes. To give you a sense of scale: 100GW is 4x the size of the Three Gorges Dam, the largest power station in the world. It’s nearly twice the amount of solar power China installed last year (an all time record). It’s even slightly more than the UK’s total installed electricity capacity (fossil and renewable). And that’s all in one go. Is solar killing coal in India? What is a solar tender? Essentially it’s an invitation for parties to submit bids to develop solar power projects, with a maximum of 100GW available in this case. Interested installers will submit bids for chunks of the 100GW, likely with a ceiling tariff and the most competitive bids will be selected. India already has a huge 10GW tender due next month, bigger than any tender they’ve done previously. India’s solar PV installations have been growing rapidly since 2016 – the country now has about 25W of cumulative solar capacity installed, with utility solar installations growing 72% year-on-year between April 2017 and March 2018. In that period, renewable energy generation accounted for about 33% of the growth in generation, as new coal installations plummeted and plant load factors for coal hovered around 60%. There is another 10GW of solar that is under construction, and the government seems confident about exceeding the country’s Paris Agreement solar pledge (100GW by 2022), though industry is slightly more guarded. Rooftop solar in particular (which is supposed to account for 40GW of the 100GW 2022 target) is moving very slowly, with just 2.4 GW installed as of March 2018. So far there are no details about said 100 GW tender — over what timeframe, what local manufacturing or solar storage conditions etc. But a few other developments in the solar universe might be relevant. 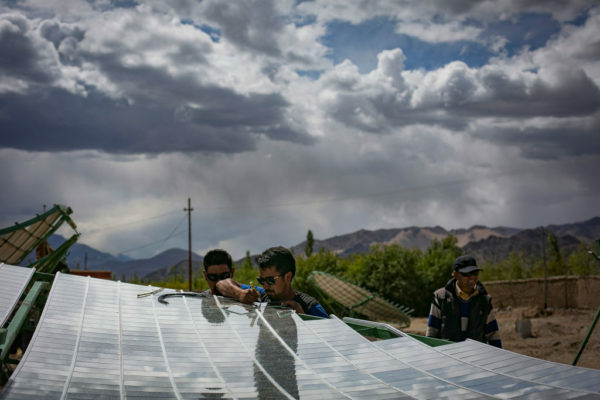 In early June, China put the brakes on its solar installation industry, leading analysts to predict a glut and price drop in solar modules and components that would benefit installing countries, including India. In mid-June, Japanese broadcaster NHK reported that Softbank had decided to invest $60-100 billion in the Indian solar generation business. Softbank refused comment, but the company has already made forays into solar PV component manufacturing in India. Singh’s 100GW remark explicitly mentioned storage and manufacturing as part of the tender. Coincidence? Perhaps. So perhaps, this month’s developments have prompted India to double down on its solar programme, looking to capitalize on the Chinese glut to attract Chinese manufacturing capacity to India? India has been trying (and failing) to boost its domestic solar manufacturing industry. That’s the positive scenario. The contrarian view would be that the government is again making for a splashy statement without doing its policy homework, as was clearly the case with the 2030 EV announcement. After the initial hype created by that announcement, the government has tried to play down the target, refused to acknowledge the need for an EV policy and has had to slow down its procurement of EVs for government use in order to get state governments on board. After all, things aren’t all hunky dory for the Indian solar industry at the moment. The threat of import duties on Chinese panels still looms large, and the confused roll out of the new Goods and Services tax regime has impacted developers. In the commercial rooftop segment, distribution companies have not been cooperating fearing the loss of high paying customers, and in the residential rooftop segment, there is a lot of red tape to negotiate to take advantage of the capital subsidies on offer. Shouldn’t these speed bumps be evened out first? 100GW of utility-scale solar would require a lot of land (2000 sq. km., assuming 5 acres/MW), always at a premium in one of the world’s most densely populated countries. India’s bureaucracy and politicians are famous for being enamoured of ‘mega’ projects — ten years ago it was mega (and then ultra-mega) coal plants and mega dam projects. Now it is mega solar projects. The true beauty of solar is its scalability and versatility. To neglect rooftop and decentralized solar to focus on huge utility projects could harm the industry in the long run. Utility scale solar has an important role to play, but due to its land requirements sensible siting policies and obtaining consent from and incentivizing local communities are important — not just from a social justice perspective, but to ensure that the project is ultimately successful and adheres to timelines. We have the example of coal’s troubles with local communities to show us how badly things can go wrong. These challenges are easily side-stepped through mechanisms that involve community members, allow for multi-purpose use of the land beneath panels etc. A 100 GW tender that incentivizes local manufacturing and storage and takes measures to avert land conflict through community benefit sharing would truly be a game changer for India. It would also be the equivalent of India throwing down the gauntlet to other countries and staking its claim to succeed China as the driver of the next phase of the clean energy revolution.